Hotel Suites Barrio de Salamanca, Madrid. 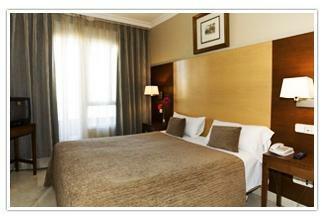 Suites Barrio de Salamanca Hotel Madrid. The Hotel Suites Barrio de Salamanca was transformed from an original historical building that was once a student's residence that housed important personalities Ortega y Gasset, Unamuno, Juan Ramón Jiménez who started working on "Platero y yo". Gustavo Adolfo Bécquer was another guest who was known for just looking out the window and enjoying the surrounding gardens contemplating. The theme of this Spanish hotel is "barrio de Salamanca" offering a comfortable traditional setting, that is perfect for all types of travelers coming to this exciting city for either business or leisure. The hotel is found in the Barrio of Salamanca district a main financial, commercial and business area of Madrid, near history, restaurants, museums and the most exclusive shops in the city. A cafeteria, laundry service and indoor parking are additional services offered by the hotel. For those coming to the city needing a place to organize a meeting or gathering, the hotel provides a room that will accommodate up to 15-20 people.